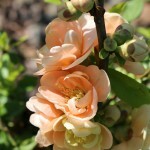 A compact shrub with an abundance of double, apricot-pink blooms in the early spring. The flowers are followed by fruit later in the summer. Green summer foliage with unremarkable fall color. It adapts to a wide range of conditions, growing best in full sun to part shade. It prefers a slightly acid well-drained soil, and will tolerate a dry site. Great for a border, as a barrier, or mass planting.